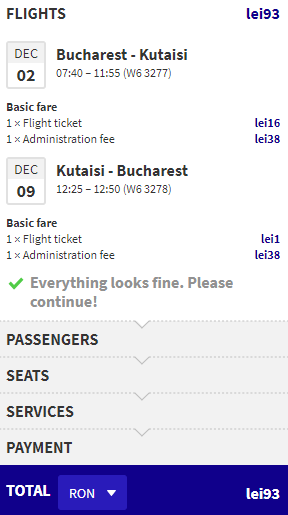 Cheap flights from Bucharest, Romania to Kutaisi, Georgia for only €19 roundtrip. Please note, to get the advertised price you must be a member of the Wizz Discount Club. The Wizz Air website allows you to view prices for the whole month so there is no need for a list of example dates from us.The Wizz Air website allows you to view prices for the whole month so there is no need for a list of example dates from us.